Dramatic last-minute negotiations on the evening of July 2 between German Chancellor Angela Merkel and her interior minister, Horst Seehofer, appeared to have headed off a potential collapse of Germany’s ruling coalition, but the knotty immigration problems Merkel and Seehofer sought to address are not going away. Merkel and Seehofer agreed to set up transit stations on the German–Austrian border, where immigrants will be detained and any who have been previously accepted by another EU nation will be returned to that nation. Immigration into Germany would be curbed. Merkel now faces a challenge from within her coalition to oust Seehofer, demands from outside her coalition to do more on restricting immigration, and the deterioration of the EU consensus on open borders. In the 2017 elections, Merkel’s Christian Democratic Union captured 33 percent of the seats in parliament—not enough to govern. Merkel made a deal with her party’s main rival, the Social Democratic Party (SDP), which won 20 percent of the seats, to form a government. The Bavarian sister party to the CDU, the Christian Social Union, headed by Seehofer, also joined in. 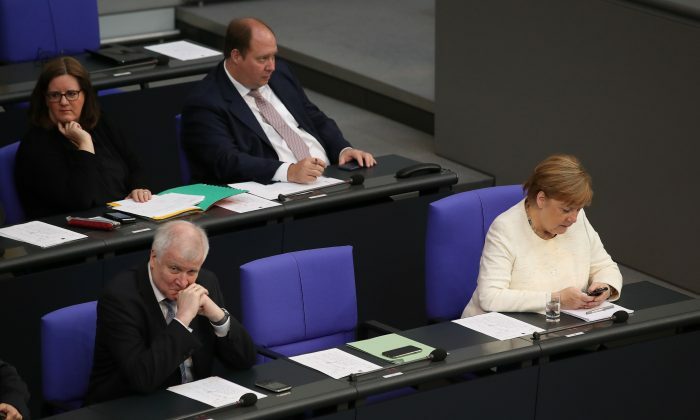 On July 3, the SDP working group on immigration issued a resolution calling for Seehofer’s resignation. In 2015, the SDP defeated another plan for erecting transit centers. The Alternative for Germany (AFD) party rode an anti-immigration platform to capture 13 percent of the seats in parliament. AFD responded to the transit center agreement by demanding the rejection of illegal immigrants and the deportation of those who have already entered. The Seehofer agreement only protects Bavaria’s border with Austria. Observers are now asking about Germany’s other borders. Meanwhile, Austria announced that it would increase restrictions on its southern border, preventing immigrants from entering the country in the first place. Such restrictions place further strain on the EU’s Schengen agreement, which provides for open borders.